Hypertension is often found when you visit your doctor. Blood pressure (BP) is measured using a cuff around your arm. You may be asked to sit quietly for 5 minutes before your BP is checked. For most people, it takes more than one high blood pressure reading to make a diagnosis. If your BP reading is high, then another reading will be done a few minutes later. If your BP is still high, you will likely be asked to come back for more checks. A high blood pressure diagnosis is made by using the average of more than 2 readings over 130/80 mmHg during more than 2 other visits. Sometimes people feel worried when they’re at the doctor's office. This can make your BP higher than it would be. You may be asked to take your BP at home or some other place such as a drug store. In some cases, you may be asked to wear a blood pressure monitor. This will take readings as you go about your day. It's often worn for 24 hours, even while sleeping. High blood pressure. National Heart, Lung, and Blood Institute website. Available at: https://www.nhlbi.nih.gov/health-topics/high-blood-pressure. Accessed October 1, 2018. How high blood pressure is diagnosed. American Heart Association website. Available at: http://www.heart.org/HEARTORG/Conditions/HighBloodPressure/SymptomsDiagnosisMonitoringofHighBloodPressure/How-High-Blood-Pressure-is-Diagnosed%5FUCM%5F301873%5FArticle.jsp#.W7JXVHtKipo. Updated January 10, 2018. Accessed October 1, 2018. Hypertension. EBSCO DynaMed Plus website. Available at: http://www.dynamed.com/topics/dmp~AN~T115345/Hypertension. Updated September 12, 2018. Accessed October 1, 2018. Overview of hypertension. Merck Manual Professional Version website. 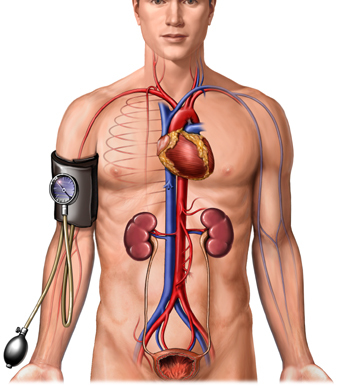 Available at: https://www.merckmanuals.com/professional/cardiovascular-disorders/hypertension/overview-of-hypertension. Updated February 2018. Accessed October 1, 2018. 1/5/2018 DynaMed Plus Systematic Literature Surveillance http://www.dynamed.com/topics/dmp~AN~T115345/Hypertension: Whelton PK, Carey RM, Aronow WS, et al. 2017 ACC/AHA/AAPA/ABC/ACPM/AGS/APhA/ASH/ASPC/NMA/PCNA Guideline for the prevention, detection, evaluation, and management of high blood pressure in adults: executive summary: a report of the American College of Cardiology/American Heart Association Task Force on Clinical Practice Guidelines. Hypertension. 2018;71(6):1269-1324.